Lymphoma develops in children commonly as an unfortunate consequence of a genetically and developmentally disturbed immune system that is incapable to appropriately adapt to and cope with certain environmental factors and to ward off specific infectious agents. According to current estimates, already well-defined single-gene defects affect up to two-thirds of children with non-Hodgkin lymphomas (NHL). Such mutations disrupt primarily components that are part of various immune and functionally closely related DNA repair pathways. Although many of them concur with clinically recognizable physical abnormalities and hematopoietic disturbances, their enormous heterogeneity and ensuing individual rarity, and their often-incomplete penetrance and striking variable expressivity together with incomplete family histories, small families and the possibility of de novo mutations pose nevertheless a considerable diagnostic challenge, which nowadays can be approached with appropriate screening methods and sequencing tools. 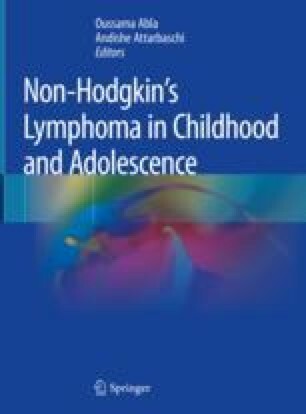 Considering the increasing interest in germline defects that predispose to childhood malignancies, we believe that the implementation and embedment of systematic analyses in the respective lymphoma treatment studies would be an especially rewarding endeavor, since the knowledge of their presence can guide the clinical management of affected patients; enable carrier screening, family counseling, and planning; as well as facilitate clinical surveillance and the application of preventive measures. The author(s) acknowledge the networking support by the COST Action CA16223 “LEukaemia GENe Discovery by data sharing, mining and collaboration (LEGEND)” as well as the “IBFM Leukemia & Lymphoma Genetic Predisposition Committee.” We also thank Fikret Rifatbegovic for help with designing and drawing the figures.